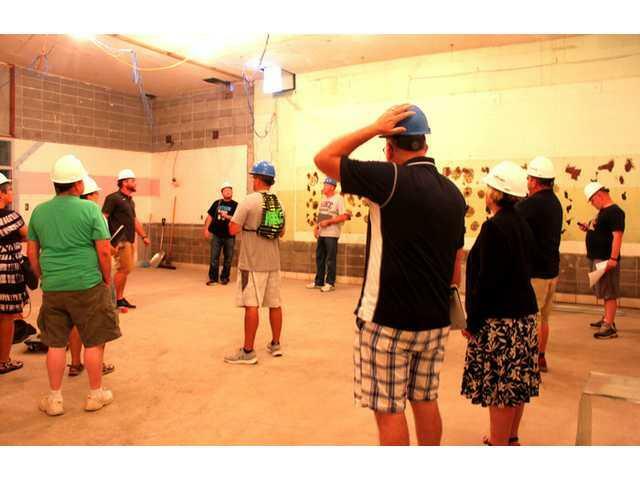 THE DARLINGTON School Board toured the high school, which is undergoing a remodel. This room, which was Room 30, will be the Fab Lab or Technology Room. POSTED July 20, 2017 10:12 a.m.
DARLINGTON – The Darlington School District Board of Education discussed moving $300,000 from their general fund balance in Fund 46 for capital projects in the future. The Finance Committee looked at how the actual expenditures and revenue came out for the 2016-17 school year and they recommended putting $300,000 into Fund 46 for the 2016-17 school year. This account is for financial resources used for the acquisition or construction of capital facilities, which include land, improvements to land, buildings and building improvements and infrastructure. The district is focusing on Building Improvements with these funds. The fund was established in February 2016 with a plan for five years before the money can be accessed. Putting the money in this year would mean the money could not be accessed for four more years. Board member Matt Wilson stated that by putting this money into Fund 46, it would immediately save local taxpayers about $100,000 in aid for the school district, which would drop the tax levy. “With the additional revenue next year from the referendum and some additional state funds coming, we think we will have plenty of revenue next year to do the projects we want to do,” Wilson said. Wilson added that the downfall is not having the money for four years but it helps them get a better interest rate. Bob Hermanson disagreed with the idea of putting the money into Fund 46. He felt it was not the right time with all the projects currently happening. “The state doesn’t have their annual budget passed. The federal government is still up in the air with their budget. I’m just a little worried about the projects going on and the cash flow,” Hermanson explained. The district would still have their fund balance, Hermanson added, but with all the projects, would hate to see it drop down and have to short term borrow. School board president Aaron Wolfe was in favor of the move. He stated that revenue from the referendum increases for next year by $200,000 and state aid will be up. The motion was made by Wilson and seconded by Matt Crist. It passed 8-1, with Hermanson against. -a donation from the Lions Club of $655 towards concussion testing athletes in grades 7-12. -donations totaling $4,350 from Parents Music Club ($2,000), Lions Club ($1,000), Optimists Club, ($500), Pop Factory Players ($750), and Wiegel Strong ($850) to the Darlington High School Music Department for choir robes. -Chris and Angela Larson’s request to host Maelle Audrey Dehalu from Belgium during the 2017-18 school year. -the Cisco/OpenDNS Umbrella cloud based technology filter for a three year subscription of $8,836. -the Shadowprotect Enterprise technology backup system (hard drive/NAS based backup), with 1 year hardware/support for $4,900 and five removable NAS devices for backup storage $1,300/server. -increasing inter-athletic pass fee from $10 to $15 and community athletic adult pass fee from $30 to $40 for the 2017-18 school year. -allowing administration to sell computers on the State surplus website. If the community comes in the next two weeks and would like some, the administration also has the ability to sell them at a reduced cost. -Karen Bennett’s request to resign as Head Softball Coach. -a student from outside the district’s request to attend a Darlington High School class with the fee of $250/semester or $500/year. -Tiffany Signer as DHS Math Teacher. -Betsy McGranahan as Assistant Volleyball Coach. -volunteers: Jonathan Bryson to volunteer as an assistant football coach at DHS and Tim Osterday to volunteer assisting taking care of the baseball field.